For some reason I always feel like when we go over a bridge we get away, even if it’s just for a little bit. I had a chance to get away with one of my smallest partners in crime, my grandson Aiden. We headed north on 41 and crossed the Caloosahatchee River bridge to tour Prairie Pines Preserve which is a Conservation 2020 land acquisition in North Fort Myers, Florida. The shell path at Prairie Pines Preserve is wide and firm and features plaques listing details and information about what can generally be observed nearby. It was a great opportunity to learn about nature plus Aiden was able to flex his reading muscles. We learned about a variety of local plants, wild animals and insects. Since this was an early morning hike we were able to spot fairly fresh footprints left by raccoon, hog and deer. There were even patches of freshly over turned soil left by a sounder of wild hogs that had grubbed their way down the sides trail. One of the highlights of our hike was spotting a rare, red banded hairstreak butterfly, which was patient enough to allow me to get a photo or two before it was gone in a flash. Prairie Pines is a really large preserve with a total of about 2,700 acres. Since there was a little person with me we only conquered a manageable, half-mile hike which constructed of a packed shell trail with a wooden boardwalk section. On the day that we visited there was an organized, guided walk that we semi-tagged along with. Keeping a seven year old on point proved challenging so we swiftly sent ourselves ahead as scouts for the rest of the group. Near the marshy area and boardwalk there is a good sized bird blind so naturists can quietly observe and photograph wading birds and critters. The water level is low to non-existent in the winter so the wildlife is completely different in the marsh and which makes this trail worthy of seasonal visits. If you’re looking for a great beginner hike, the ADA portion of Prairie Pines Preserve has been field tested and proven a great place for a beginners and young people. For those who are more adventurous there are over 18 miles of marked, primitive hiking plus equestrian friendly trails just waiting to be explored. 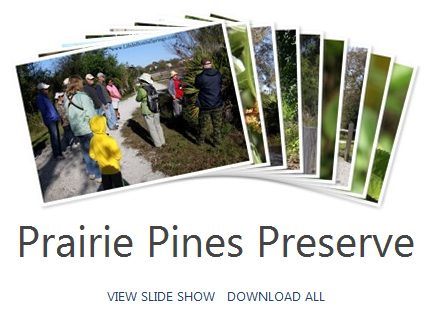 Prairie Pines Preserve is a park offering a wide variety of activities. In addition to hiking it offers a full parking lot with spacing for horse trailers, hitching posts for the horses, restrooms, bike trails, bird watching, horseback riding, geocaching and a picnic area so it’s fun for the whole family. 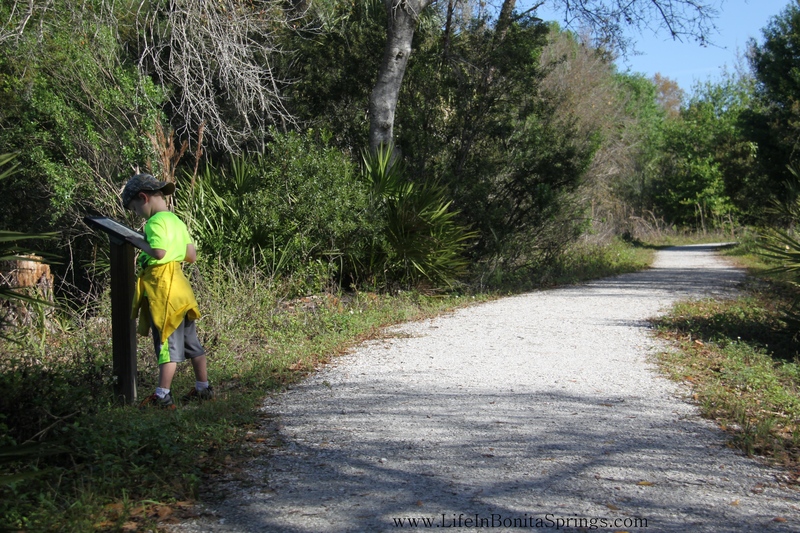 Prairie Pines Preserve is located at 18400 N. Tamiami Trail, N. Fort Myers, Florida. Fair warning that Google maps weren’t exactly accurate with the address so keep your eyes peeled for the sign on the east side of 41. Mark your calendars for this December to catch the Conservation 2020 Saturday morning guided walk series which runs through March. The tours are at various parks and preserves and there is no charge to attend. Learn more by visiting their website at www.Conservation2020.org.